It’s March madness and I had to slip away for some non-basketball talk. So I am going to share some recipes with your. Children of all ages will enjoy these tasty treats! They are sweet or salty or BOTH. They are colorful and delicious. Soon, it will be Student Appreciation week, so I am dusting off some old and trying out some new recipes. One of my favorite snacks is Birthday Cake Batter Popcorn. Never heard of this? You are missing out on a sweet and salty treat. This recipe calls for melted white chocolate and cake mix. CAKE MIX. It’s kind of brilliant. There are many recipes out there using cake mix to make other treats like cookies, but using it with popcorn and chocolate is amazing. I have made this for my students a number of times, and they are always puzzled with the familiar tastes. I make them guess what’s in it. They never can figure it out. Melt the bark/chocolate in the microwave. Put it in the microwave in 30-second intervals, stirring in between each 30 seconds until it is fully melted. Add the vegetable shortening to the melted bark/chocolate and stir until it is melted. If you need to, you can put it back into the microwave to help melt it. Add the cake mix to the bark/chocolate and stir until completely mixed. Pour the coating onto the popcorn and coat evenly. I usually put it into a huge bowl and toss with either big spoons or spatulas. Pour the coated popcorn onto cookie sheets to cool and harden. Immediately sprinkle the popcorn with sprinkles. Wait until it’s hard. Store in an airtight container well cool. I put it in plastic sealable bags when I bring it to school. These cookies are yummy! They are soft and chewy and colorful! If you are going to a kid party, these will be your go to recipe. The trick to keep them from spreading while baking is to refrigerate them. With handheld or stand mixer, cream the softened butter for about one minute on medium speed. Cream it until smooth. Add sugar on medium speed and cream until fluffy and light in color. Mix in the egg and vanilla. Scrape down side of bowl. In another bowl, whisk together the dry ingredients: flour, salt, baking powder, baking soda and cream of tartar. On low speed slowly add the dry ingredients to the wet ingredients. Dough will be thick. Fold in ½ cup of sprinkles. Scoop about 2 tbsp. of dough and roll into a ball. Chill balls on a cookie sheet for at least 2 hours. I put them all on one cookie sheet to chill, but baked on 2 cookie sheets. They take up too much room in the refrigerator to put both in. Chill dough balls for at least 2 hours and up to 48 hours in the refrigerator. Bake chilled cookie dough for 8 minutes. You do not want them to brown. The cookies will appear to be undercooked and soft. Allow the cookies to cool on cookie sheet for 3 minutes and then finish cooling on wire rack. Cookies freeze well and keep up to 3 months to bake later. *To soften butter, cut stick of butter into 6 pieces and microwave for about 10 seconds. ** Room temperature egg is required. Place in warm glass of water for about 10 minutes. College boy is home and is getting all of his favorite meals. 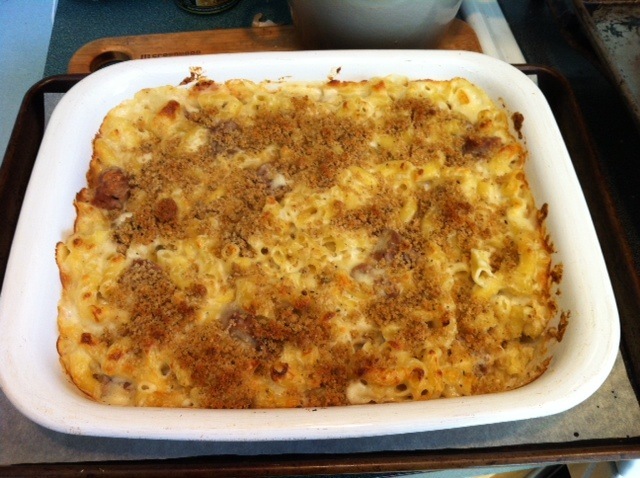 Tonight I made mac and cheese with turkey sausage, or as he calls it “heart attack on a plate”. I’m not going all Paula Deen on you, but every now and then, a little butter, cheese and pasta is okay. I cook the turkey sausage as I prep the meal. I simmer it in a little water, lid on, for about 20 minutes. I take the lid off and let the water evaporate. As it evaporates, the sausage browns. I lower the heat to medium/low to brown the sausage Remember to turn the sausage to brown all sides. Don’t walk away because the sausage can burn pretty quickly. The browning gives it a wonderful flavor. Drain it on a paper towel and then slice. Cook elbow macaroni according to directions, about 7 minutes. To make the white sauce, you need to heat the milk. You can heat it in a saucepan, or carefully microwave it until it is very warm. Do not let it boil. In the pan, you cooked the elbow macaroni; heat 6 tablespoons of butter on a medium heat, leaving the remaining 2 tablespoons for the topping. Whisk the flour into the melted butter and cook for one minute. Whisk in the heated milk. Continue to whisk until this mixture starts to thicken and becomes smooth. Turn off the heat and add the cheeses, salt, pepper and nutmeg. You can use whatever cheeses you like in this. I often use mozzarella and cheddar cheese. Fontina and Gruyere are very creamy. Goat cheese adds a wonderful tang. So many come packaged that you have many options. I like using several mixtures of cheese. Don’t use more than 6 cups. I prefer 5 cups of cheese. Whisk the cheese until it is melted. Pour in the cooked and drained macaroni and stir until it’s all coated. Add the cut up cooked sausage. Pour into, at least, a 3-quart baking dish. You may want to use a large one. I also cook it with a cookie sheet underneath, in case it bubbles over. Melt the remaining 2 tablespoons of butter and then add the breadcrumbs. You can use a little more or a little less. You want a nice crumb topping to sprinkle over the macaroni. Bake for about 30 minutes or until it’s bubbly and the macaroni is slightly browned. Climb into the time machine with me and travel back into my newlywed daze days. Suzanne introduced me to many things in life. A different view on food was one that truly influenced me. She made brunch. BRUNCH! We spent a lot of time with Suzanne and Tom. Some great moments we shared, were brunching on a Sunday morning in their East Boston home. Kids, dogs and wonderful memories. So I stole borrowed her recipe. 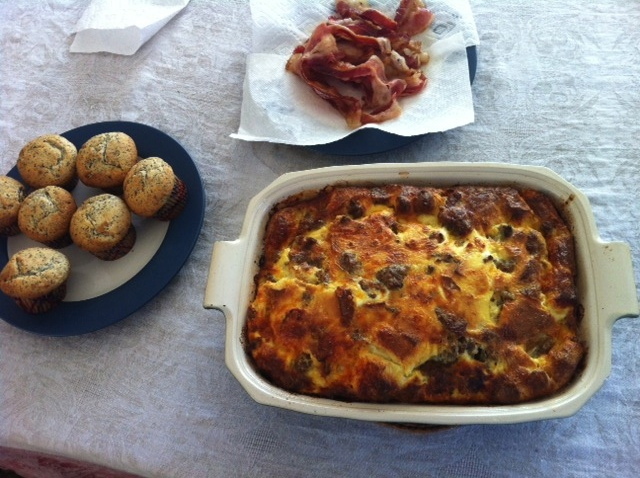 It’s really an egg strata, but back then there were no FOODIES to correct us. As my children grew and got busy, Sunday morning brunch was one of the few weekly meals we could all share. I tried to do it up big, with Belgian waffles topped with strawberries, whipped cream and bacon on the side, pancakes (yawn) and this egg dish. I like it because you make it the night before and just bake it in the morning. The kids liked it because, well, it’s delicious. It doesn’t hurt when I serve it with poppy seed muffins and bacon. My favorite part was sitting around the table after the food was devoured, talking and laughing with the kids. Those are precious moments. Don’t tell them! You’ll blow my cover. First, brown the sausage in a pan. I let it sit in the fridge overnight so it will defrost. I break it into pieces, not too small, not too big and let it brown. Drain on paper towels. You can do this step ahead of time and store it in the fridge. This is the most time-consuming part of the recipe. I don’t grease my pan. I use a ceramic casserole dish that cleans very easily. You can use a greased 9 x 13 x 2 pan. Mine is a little smaller and it allows the egg dish to really puff up while it’s cooking. 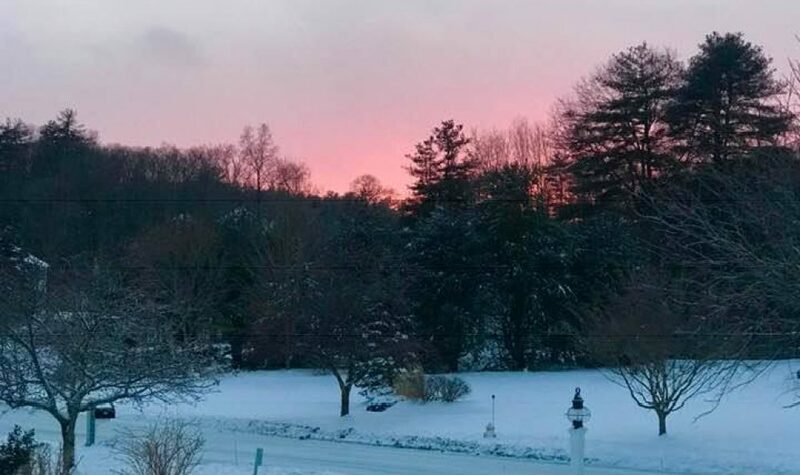 It’s pretty, but it does fall as it cools. In the baking pan, mix (do not beat) eggs, milk, salt, pepper, bread and cheese. Stir in the cooked sausage. Cover pan with plastic wrap and place in fridge over night. Bake uncovered for one hour at 350 degrees. Before you put it in the oven, take a fork and just stir it all around once. Serve with bagels, muffins or cinnamon rolls and bacon of course. Maybe sausage too! Serves 6 hungry Brosseaus. Sometimes during the day, I need a snack. The vending machine calls to me, but I stroll by with a quick glance. I try to bring my own healthy snacks. Well, sometimes. Licorice is healthy, right? Chocolate? The whites of hardboiled eggs are kind of stinky to my student workers. I decided to try something new and make some granola. It can very expensive to buy and is usually full of fats and sugars that are not healthy. They advertise themselves as health foods, but read the labels. If you make your own granola you can control the sugars and fats. Plus, granola is very easy to make. I won’t say it’s inexpensive, but you can reduce the ingredient costs. I bought my seeds and nuts at Whole Foods. I purchased just what I needed from the bins, and it was not very expensive. The most expensive part, for me, was the dried fruits. They can be costly, but I think they really make the granola special. I replaced some oil with homemade applesauce and used a combination of maple syrup and honey for sweetness. Spices were a bonus as the kitchen smelled like a bakeshop. So let’s talk about granola basics. First you need a grain. Most recipes call for rolled oat such as the “old-fashioned” kind, not the instant or quick cook oatmeal. I use about 3 cups of oats. Nuts add texture, flavor and many nutrients. Use about 1 to 1 ½ cups of nuts. I love cashews, but almonds are fabulous. You can use any nuts. Sweeteners like honey, maple syrup, and agave or rice syrup work well as they coat the granola. I like to heat the liquid sugars and add some brown sugar for caramelizing and crunch. Oil is important to get the granola crispy and prevents stickiness. Try to use neutral oils like canola or grapeseed. Melted coconut oil adds flavor. It’s the rage now. Just as in baking, you need salt. For granola you only need a teaspoon. Seeds like pumpkin, flax, sunflower and flax toast up and are very nutritious. Unsweetened coconut flakes toast up and add a wonderful flavor. Dried fruits in my opinion make granola delicious. I love to use dried apricots and dried cranberries. 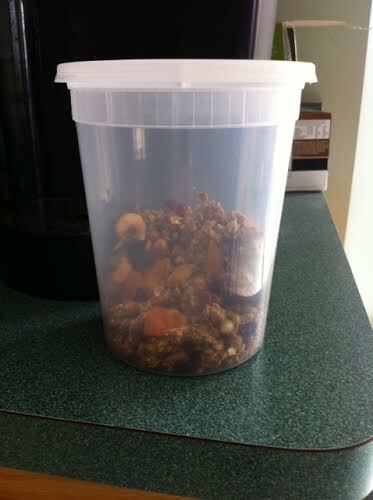 You can use any dried fruit, but remember to add it after you cook the granola. Dried fruit will burn; trust me. Spices are important. I like to use cinnamon, nutmeg and ginger. A little goes a long way, so I only use about ½ tsp. of each. You can add ¼ cup of cocoa powder with your other dry ingredients before baking, or use 1 cup of chocolate chips after the granolas has been baked. You can replace some of your oil with one egg white beaten until frothy. Proteins help bind the granola and get it crispy. Combine the oats, seeds, spices, salt, and nuts in a large bowl. In a saucepan, heat up the applesauce, maple syrup, honey, brown sugar and oil. Heat until the brown sugar has melted and the mixture is hot. Take off the heat and stir in the vanilla extract. Add this warm mixture into the dry ingredients. Mix until the thoroughly coated. 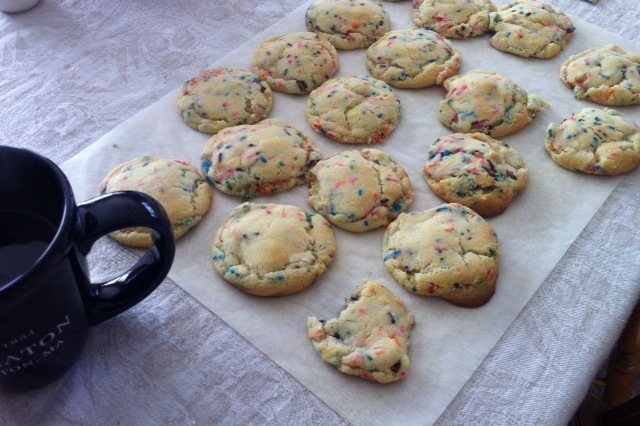 Spread the mixture onto a parchment paper covered cookie sheet. Bake the granola for about 30-40 minutes, stirring every 15 minutes, until the granola has become golden brown. 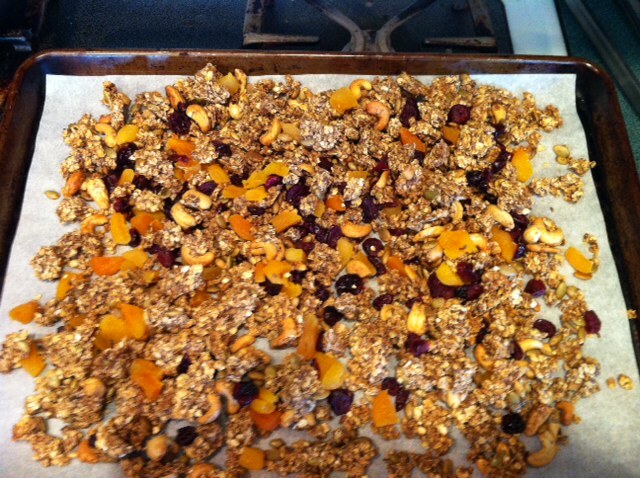 The granola will not be crunchy until it’s cooled, so don’t wait for it to be crunchy to remove from the oven. Remove from oven and cool, adding the dried fruits. Once it’s completely cooled, store in an airtight container. I love to mix it into Greek yogurt for lunch.